The Cache add-on creates static HTML files of Ajax Load More requests then delivers those static files to your visitors without querying the database. Caching will improve the user experience of your site by boosting server performance and dramatically reducing content load times for your visitors. The Cache add-on takes the results of each initial Ajax Load More query and creates static HTML files within the /ajax-load-more-cache/_cache directory. The static HTML files are then referenced and served to your visitors without making additional ajax requests to your WordPress database. The cache is created on the fly the first time a user visits a page and loads Ajax Load More content. During the cache creation process it will be invisible to the user that they are creating the new cache content. The next user who visits that same page will be served the cached static HTML and Ajax Load More will not make any database requests until the cache is cleared. During the process of creating the individual cache files a 404 error may appear in the developer console of your browser, this does not affect the rendering of the page but is a necessary occurrence while Ajax Load More creates the static HTML files. 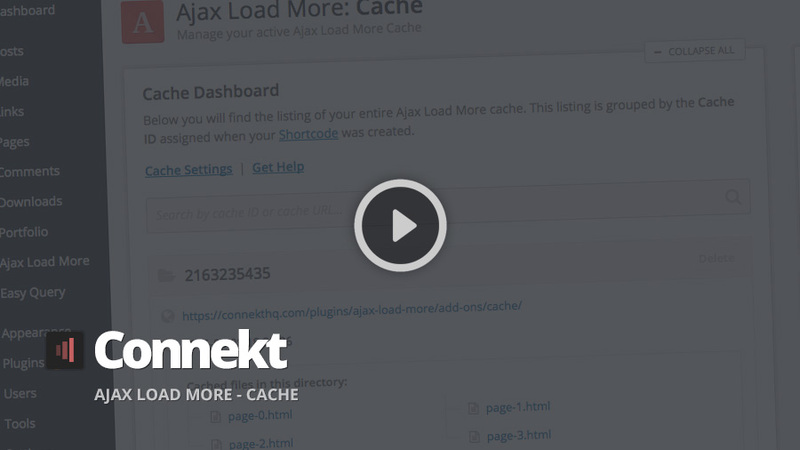 To enable caching you must activate the Cache add-on with each ajax_load_more shortcode – this will give you complete control over what content is cached across on your site. Simply set cache to true, generate a unique 10 digit cache_id using our random ID generator and caching will be enabled for this specific Ajax Load More instance. While it is possible to modify the unique cache_id, it may result in undesired results and we highly recommend caching using the ID value assigned by the random generator. Try it for yourself! Click the Load Posts from Cache button below and notice the speed at which the posts are loaded. The Ajax Load More Cache dashboard has been designed and developed to give you a transparent overview of your current cache. You can delete the entire cache or choose to delete individual directories – you can also search for cached URLs or IDs and view statistics on the amount of files and directories currently in the cache. Within each of the directory listings you will find a link to the Cached URL, the date and time the cache was created and the complete list of static HTML files created by Ajax Load More Cache. By default, the Cache add-on will write and serve all cached files from your WordPress uploads directory (/wp-content/uploads/alm-cache/). As of version 1.5 users are able to adjust the location of the ALM cache by using the following filter hooks. The alm_cache_path filter can be used to update the absolute server path of the Ajax Load More Cache – this path is used when writing and saving files to your server. The following snippet will adjust the default cache path to a /cache/ folder in the current theme directory. The alm_cache_url filter can be used to update the URL path to the Ajax Load More Cache – this URL is used when rendering the cached content of an Ajax Load More query. The following snippet will adjust the default cache URL to a /cache/ folder in the current theme directory. NOTE: When filtering the cache location you must update both alm_cache_path and alm_cache_url hooks. The Ajax Load More cache can be set to auto-generate by populating the alm_cache_array filter in the backend of your site. Auto-generating the cache benefits both developers and end users as it provides the ability for admins to build out a complete cache of the Ajax requests before users visit the website. During the build process, admins are able to track the progress and status of each cache instance directly on the Ajax Load More Cache dashboard – more info the docs. The Cache add-on has global settings (available on the main Ajax Load More settings screen) that can help automate the cache process. Published Posts – Checking this box will flush the Ajax Load More cache every time a page, post or custom post type is published or updated. This will ensure your visitors are always seeing the latest content. Known Users – Checking this box will turn off caching for all logged in users – from subscribers all the way up to site administrators. Upon purchase of this add-on you will receive a confirmation/purchase receipt email. Your receipt will contain a direct link for downloading your copy of Ajax Load More: Cache and a license key. Reduced page and content load times has proven to increase visitor time on your site and the number of pages viewed. Reduced the amount of stress on your server by serving static HTML files. Eliminate any load delays and get the content to your visitors faster and more reliably. 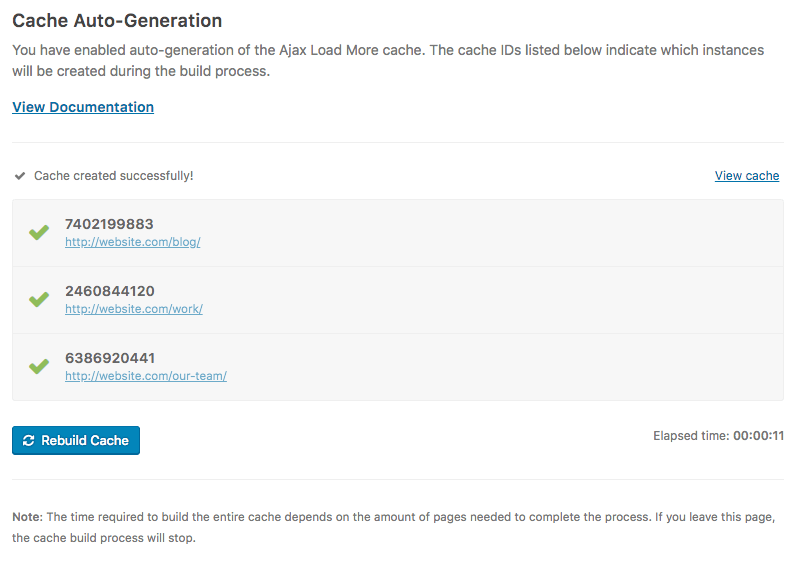 The Ajax Load More cache can be auto-generated by hooking into the alm_cache_array filter- view docs. 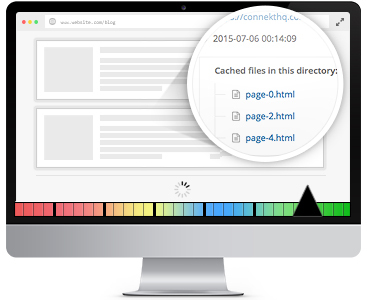 Take full control over your cached content with our intuitive cache management system. The following Ajax Load More add-ons and extensions are currently NOT compatible with the Cache add-on – We are working on these integrations and they will be released as completed. NEW - Added functionality to auto-generate ALM Cache - [view docs](https://connekthq.com/plugins/ajax-load-more/docs/add-ons/cache/#auto-generate). NEW - Added new `do_action(\'alm_clear_cache\')` function to clear the entire cache. This allows developers to run custom cache clear scripts. NEW - Added uninstaller script to remove `alm-cache` directory on plugin deletion. UPDATE - Removing `mkdir()` functions in favor of core WP function `wp_mkdir_p()` which helps with permission issues on directory creation. 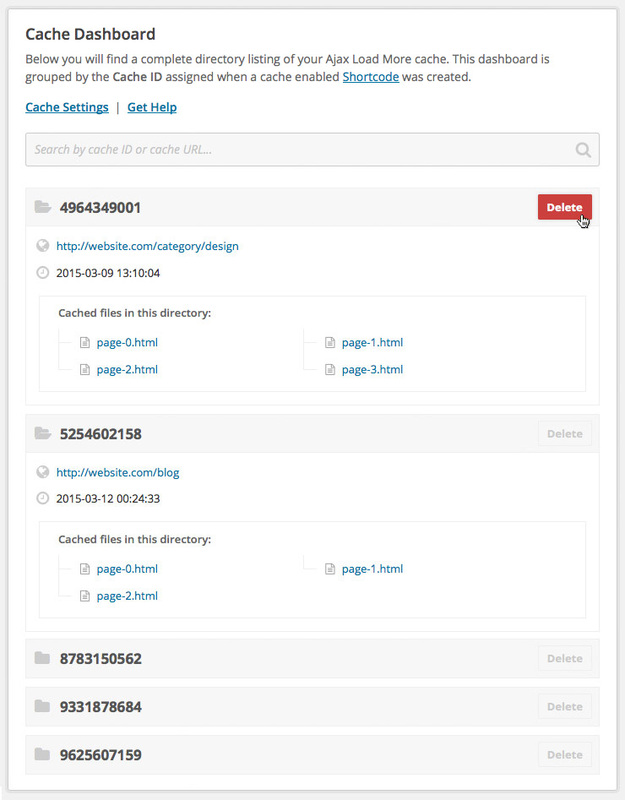 FIX - Fixed bug with cache creation for paged URLs and the SEO add-on. NEW - Added new `alm_cache_deleted` action dispatched after Ajax Load More cache is deleted and created. NEW - Added new `alm_custom_user_role` filter that allows developers to define the [user role](https://codex.wordpress.org/Roles_and_Capabilities) for access to view and delete the Ajax Load More cache. Default is [edit_theme_options](https://codex.wordpress.org/Roles_and_Capabilities#edit_theme_options). NEW - Added new language file for localization. UPDATE - Code clean up. UPGRADE NOTICE - You should update core ALM to 3.3.0 before updating Cache to 1.5.1 UPDATE - Updated interface of the cache dashboard to match updates to core ALM admin interface. NEW - Added support for caching single posts with the Previous Post add-on. NEW - Added new `alm_cache_path` filter for updating the path to the cache directory. NEW - Added new `alm_cache_url` filter for updating the URL to the cache directory. UPDATE - Added hook (future_to_publish) for clearing cache after schedule pos is published. UPDATE - Updated value passed by the `data-cache-path` parameter. This parameter was required while using cache and filtering. Path without the cache_id is now passed as the `data-cache-path` value. UPDATE - Removing deprecated activation and de-activation functions. UPDATE - Moved cache directory from the ajax-load-more-chace directory to the WordPress uploads directory (uploads/alm-cache). UPGRADE NOTICE - This update requires Ajax Load More 2.13.1. FIX - JS issue with Cache settings page for Addon users. UPDATE - Fixed header alignment issue on Cache settings page. FIX - Adding support for Theme Repeater Templates. FIX - Fixing issue with deletion of individual cache items. UPDATE - Updating plugin update script. Users are now required to input a license key to receive updates directly within the WP Admin. Please contact us for information regarding legacy license keys. UPDATE - Moved Cache admin settings and shortcode settings from core ALM to add-on. Fixed issue with Cache + SEO where initial user might end up caching multiple pages in a single query if the page requested was greater than 1.